Disclaimer: As a Netflix Stream Team member I received something of value for sharing this post with you. Raise your hand if your kids love dinosaurs. Now raise your other hand if your kids love construction trucks. 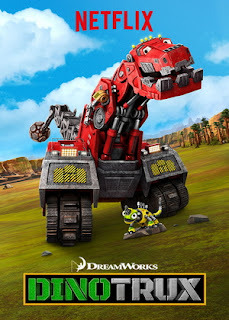 Finally, jump up and down if you think your kids will love the newest Netflix original kids series from DreamWorks, Dinotrux. Dinotrux, is a brand new action-packed original series based on Chris Gall's award-winning books featuring characters that are half-dinosaur/half-construction vehicle. Ty Rux and Revvit, two unlikely best friends, build a bigger, better world and battle against the biggest creature of all D-Structs, who threatens to wreck everything they've built. Dinotrux mixes action, comedy and adventure while focusing on teamwork and friendship. Families who watch together can discuss that even when friends are different, everyone can bring something of value to the table and work together for the greater good of all. Project Mc² Netflix Original Series, proves smart is the hottest trend. The show features four supercool teen spies who show how girls can use their science smarts and math problem-solving skills to save the world.